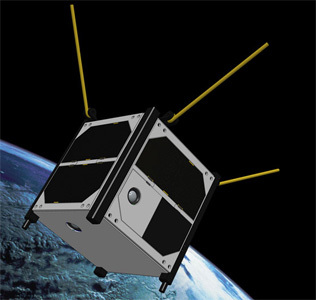 ArduSat 1 (Arduino Satellite)) and Ardusat X are two 1U CubeSats, whose mission is to provide a platform on which students and DIY space enthusiasts may design and run their own space - based Arduino experiments. They are being built as a crowd-funded project by NanoSatisfi Inc. The satellite’s primary payload is bank of Arduino processors on which student/DIY code may run. The Arduino processors may sample data from the satellite’s imaging payload, a 1.3 megapixel optical CMOS camera module, and/or any of the satellite’s on board sensors, which includes photolux sensor, IR temperature, PCB temperature, 3-axis magnetometer, Geiger counter, 6-DOF IMU, and MEMS gyros. The two ArduSats were launched on board of HTV 4 to the International Space Station, from where they were deployed on 19 November 2013. ArduSat X and ArduSat 1 re-entered the atmosphere 15 April 2014 and 16 April 2014 respectively.